I was playing around with a stack of 1 1/2″ and 2 1/2″ strips the other day and I thought…. this would be a fun share for my blog. 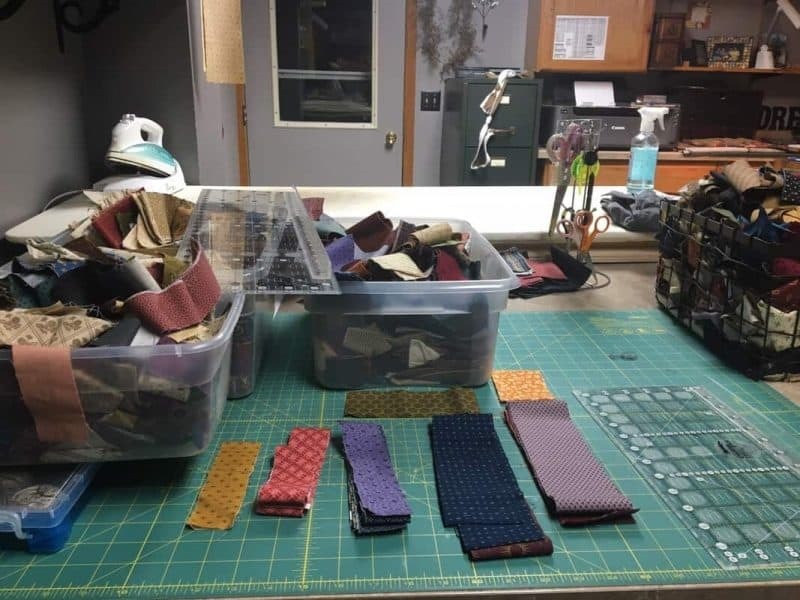 How many of us have strips of fabric left over after cutting out a project? Raise your hand …. don’t be shy! 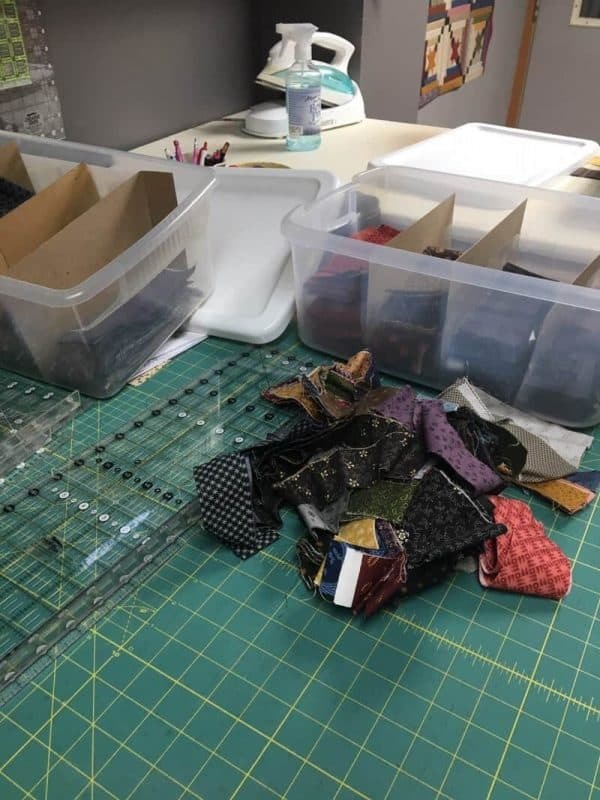 Here’s a photo of some of my strip mess that I let accumulate while cutting out and making other quilts. 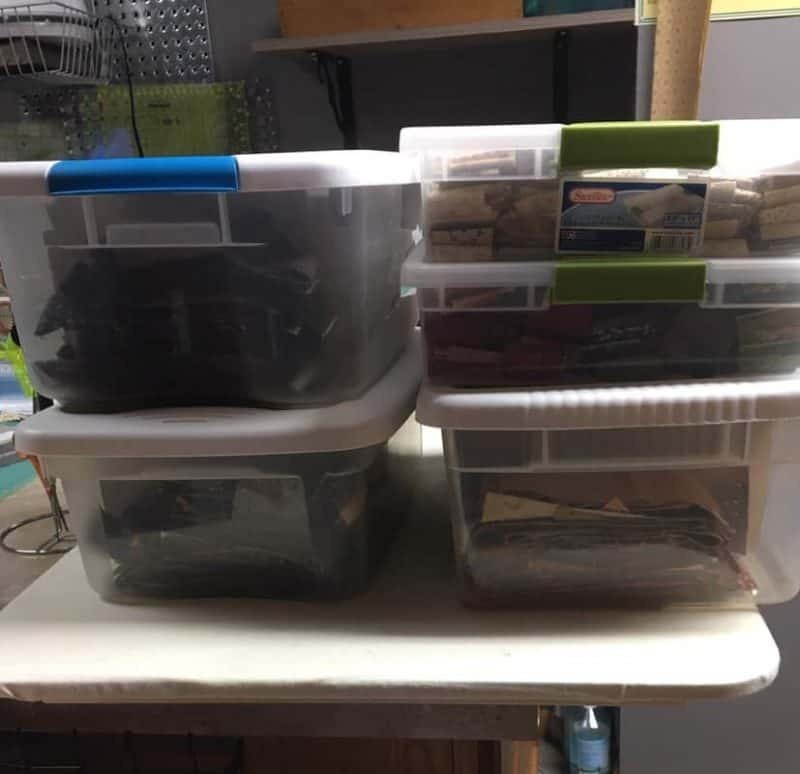 I do also have some more orderly storage …. when the strips make it there …. these small plastic tubs work great! 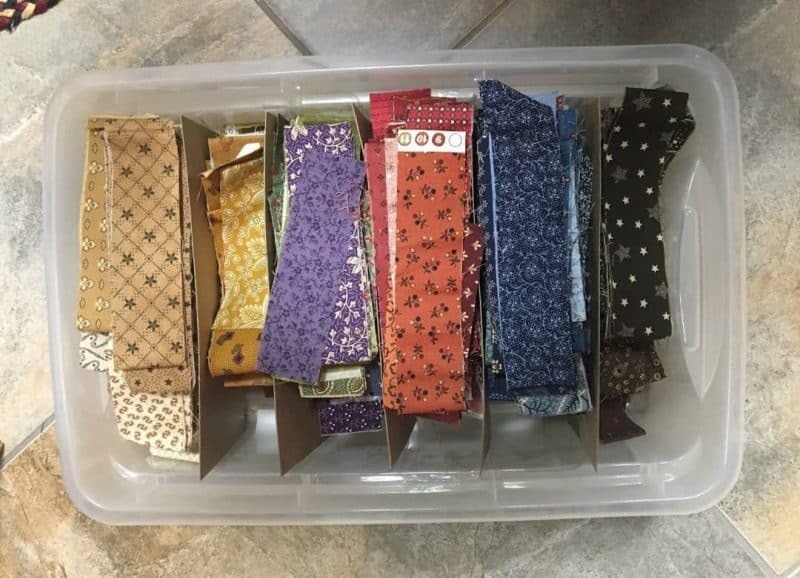 Since I have too many strips lying around, I thought it would be fun to share some of the things that you can do with 1 1/2″ strips or a combo of 1 1/2 and 2 1/2″ strips. Here’s a block I think I will be using in an upcoming project. I think this is going to make a fun quilt. Now I just have to decide how big! 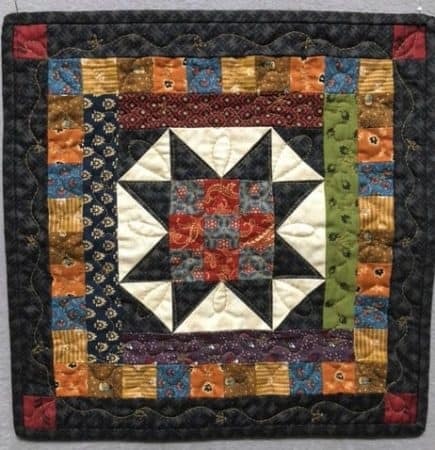 This variation of a log cabin uses a 2 1/2″ black squares cut from a strip with color print and tan print 1 1/2″ strips to make the “logs”. 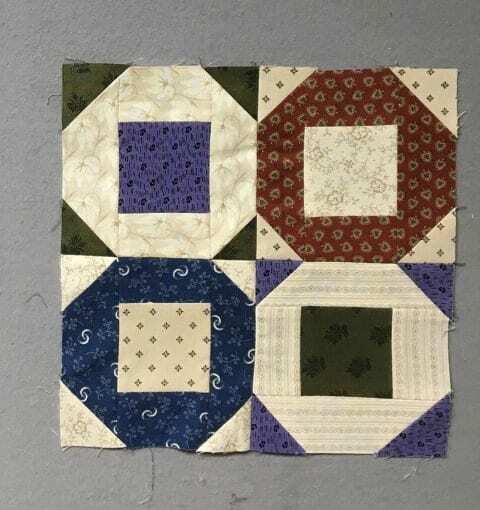 There’s the simple, but fun 9-patch block that can be made completely from 1 1/2″ pieces cut from strips. Or you can make the blocks bigger by using 2 1/2″ pieces cut from 2 1/2″ strips. How about a Dutchman’s puzzle block? In two sizes! This first one is make with all 2 1/2″ pieces and the second one is made with all 1 1/2″ pieces. This is a fun variation where you have the 1 1/2″ strips, but also do a flip and sew corner on the inner bars of the rail fence to make a center friendship star! 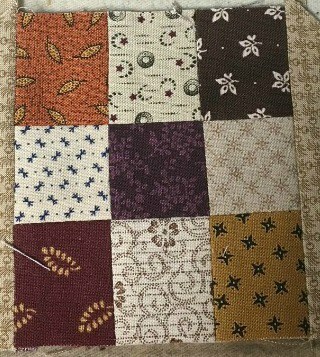 Add some strips and checkerboards to an “orphan” block and make a small candle mat for an instant gift. 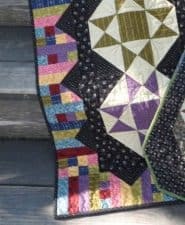 Use strips to make some fun borders on a quilt to make it larger. Finally, make a scrappy binding! 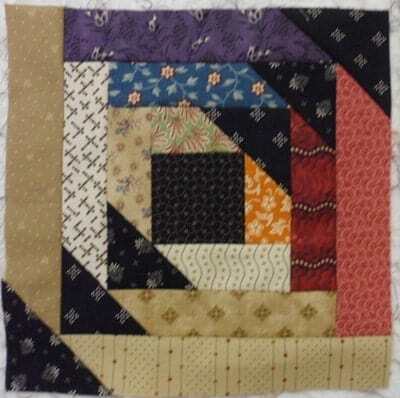 I bet if you look through a block book, you can find many, many more blocks that can be made with your strip collection. The fun about that is that you can make the blocks as scrappy as you want! So, grab your basket of scraps and start creating! 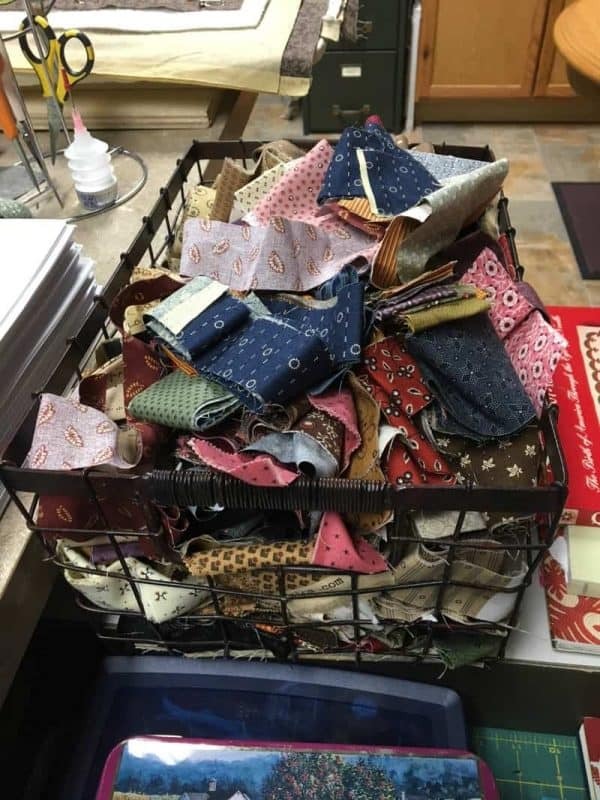 I Like Scraps …. Do You? So what can you do with all these leftover strips? 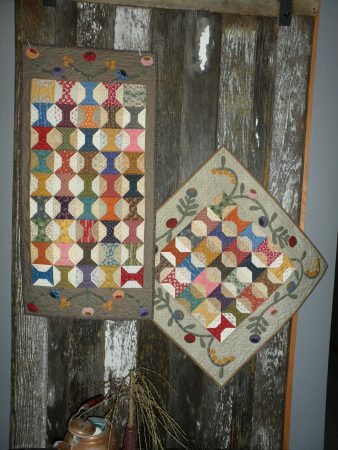 I like to design patterns with log cabin blocks. 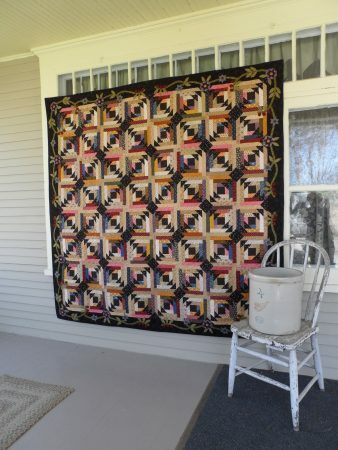 And 1 1/2″ and 2 1/2″ strips are great to make a very scrappy log cabin quilt. 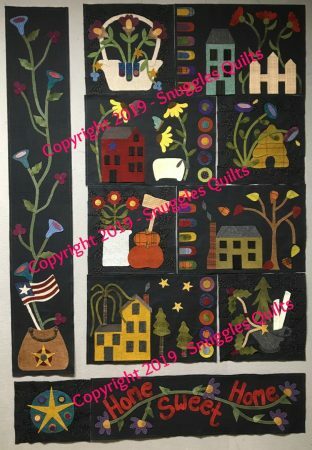 I used mine to make a Courthouse Steps Log Cabin block (above). Of course you can also use them to make traditional Log Cabin blocks as well. 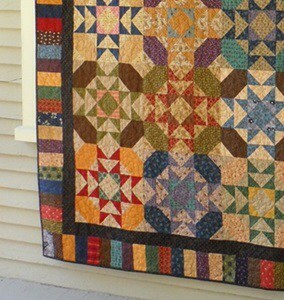 Another great use for leftover strips are pieced borders. 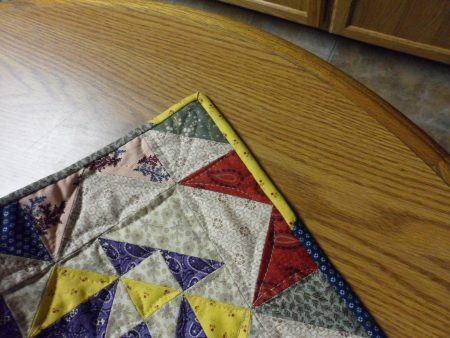 Especially if you finish a project, have lots of fabric left over and you want to make it bigger. This example below is the piano key style strip border created by using 2 1/2″ strips. 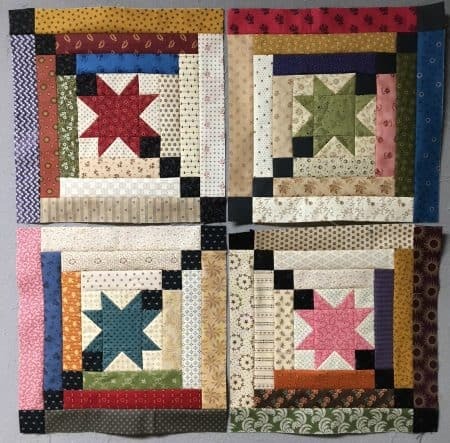 Another option is to mix pieces cut from 2 1/2″ and 1 1/2″ strips to make a unique border. 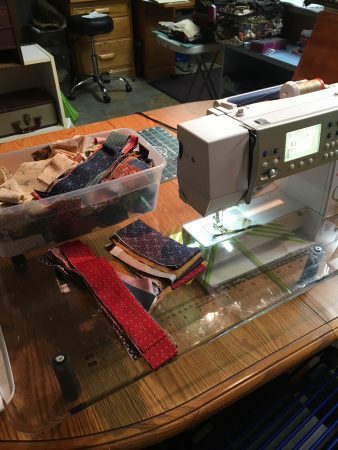 Finally another use for my strips is to make scrappy binding. 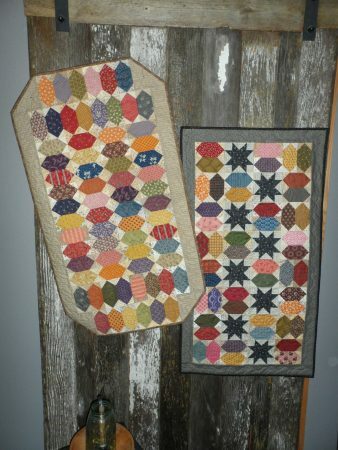 What a great way to use up the fabric from a project! 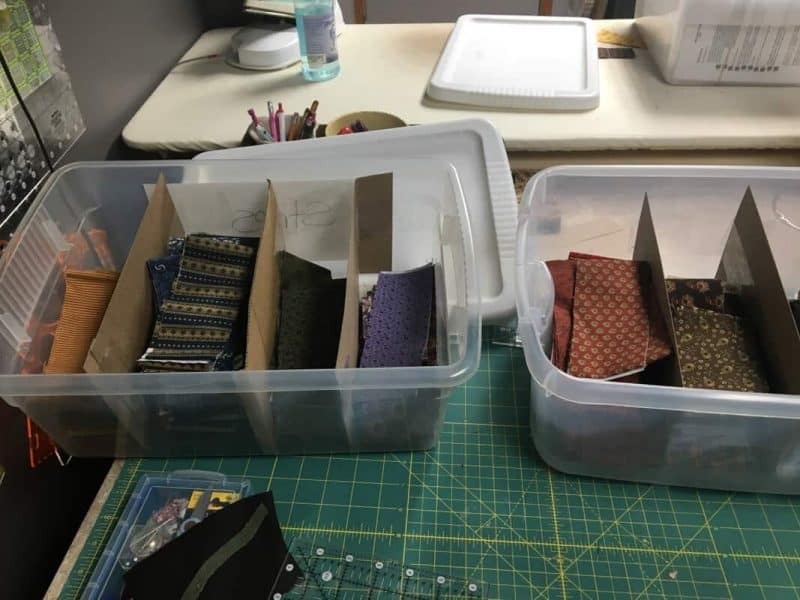 And you do not have to buy additional fabric for a binding. 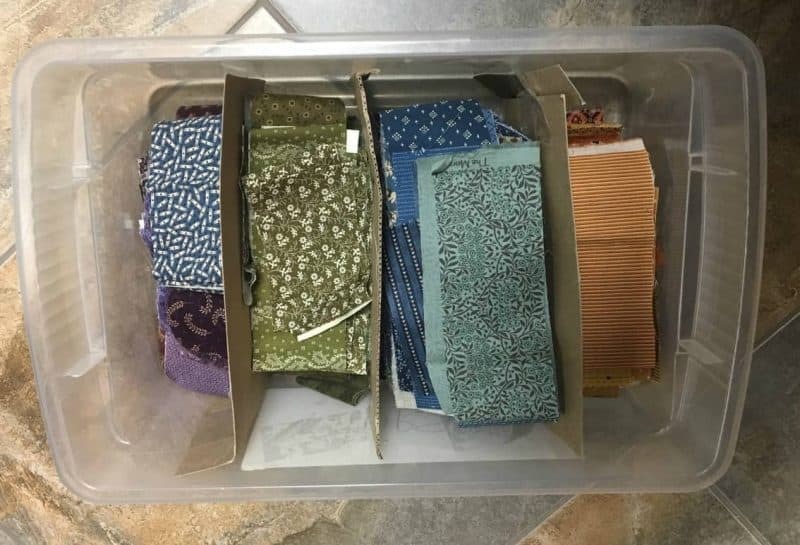 If it does not work to cut a leftover piece of fabric into strips, I separate those pieces by color and put them into bins to use in appliqué projects. Instead of having to cut into a larger piece of fabric for a small flower, I just dig into my appliqué bin of the appropriate color! Another way I put scraps to use is to use them to make test blocks. I make these when I am trying out color ideas for a block. 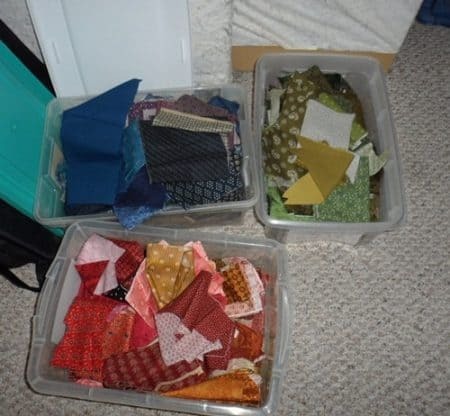 Instead of cutting into “fresh” fabric, I dig through my scraps for colors I want to audition and make the block. I can even make two or three different variations. 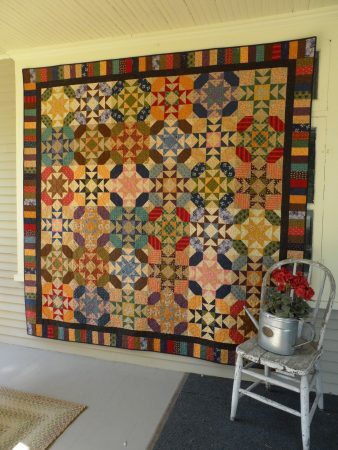 Once I have chosen the color combo I want, I can purchase the fabric and make the quilt with no worries. This is also a great idea because it familiarizes you with the pattern instructions before you tackle the whole project. 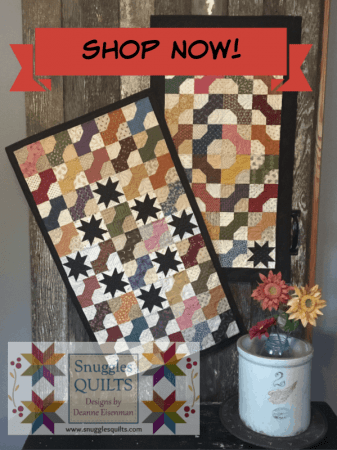 So do you want to try a scrap quilt and are not sure how to get started? 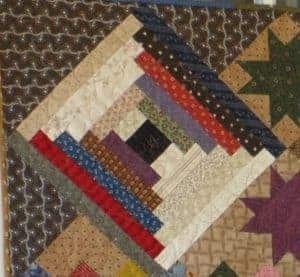 Try a “planned” scrap quilt. 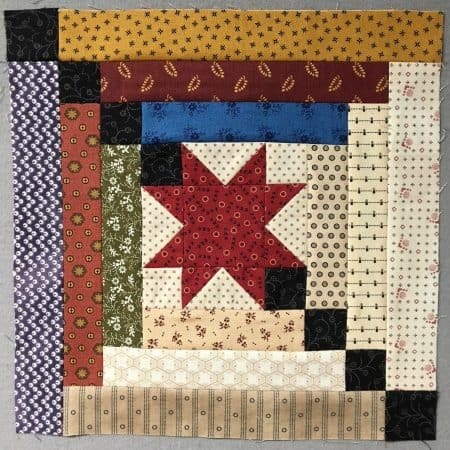 Take a quilt pattern for a quilt made with one block make each block separately using different colors (but still coordinating). 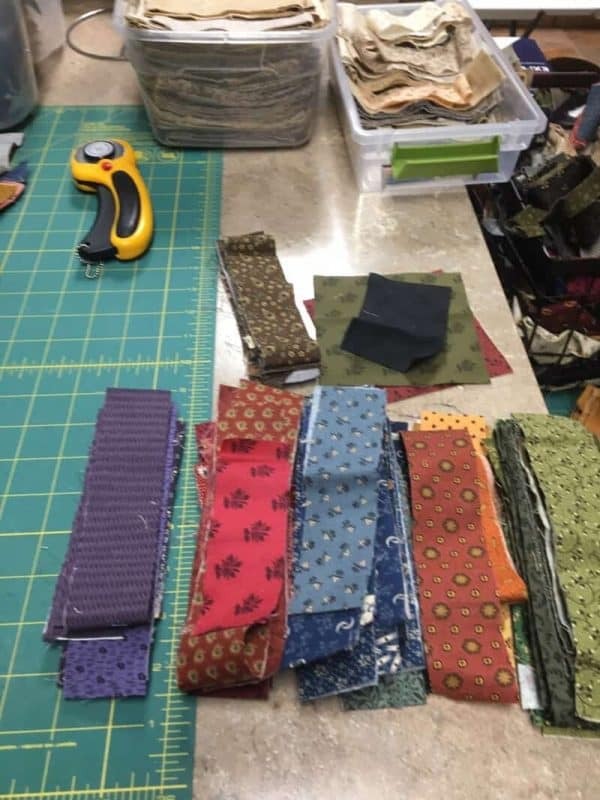 Another way to get scrappier is to do it while buying fabric. 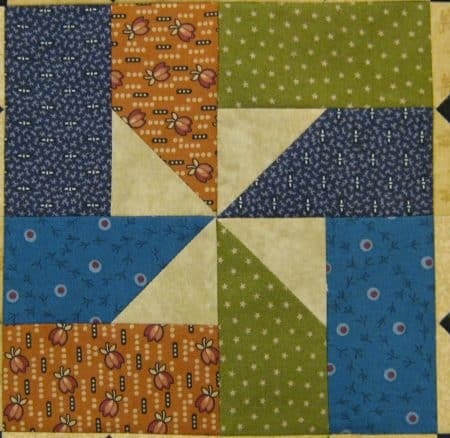 If a pattern calls for 1 yard of blue, consider buying 4 fat quarters in different blues or other colors in that color family. Do the same for the other colors in the pattern. You’ve instantly made it scrappier! 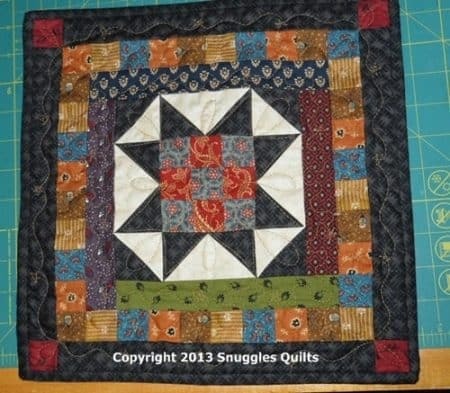 The key to enjoying scrap quilting is to let go and have fun! Buy smaller cuts of fabric in many colors from your local quilt shop instead of larger cuts of just one color. 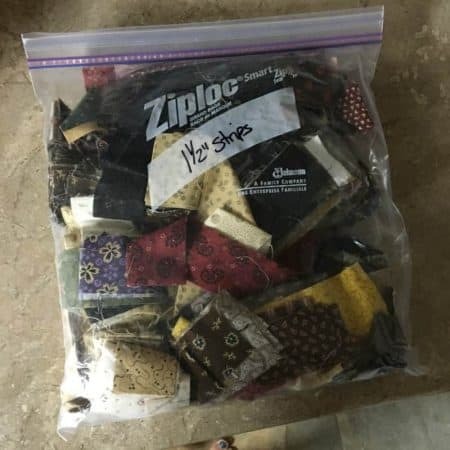 Once you build up a stash, it’s fun to go “shopping” there and experiment. 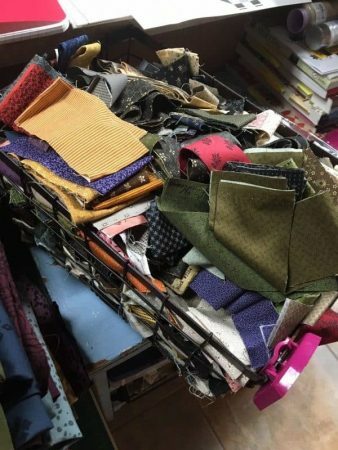 Fabric Conservation – Use those scraps instead of tossing! Here is a tip that I call “bits and pieces” because it’s a way to use more of that precious fabric! I thought about this when talking with a guild member at a recent presentation. She said she didn’t like the fabric waste that came with making flying geese units the way I made them in my patterns. So it inspired this blog post. 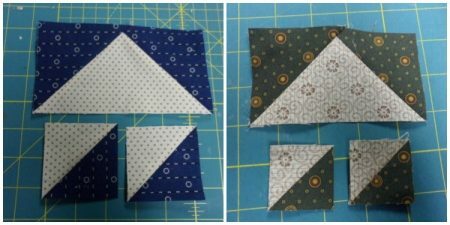 Make Half-square Triangle Squares While Making Flying Geese! Last week I was making several large flying geese units for a quilt. This tip works best if your flying geese units are larger ones, for example 3 1/2 x 6 1/2″ geese. 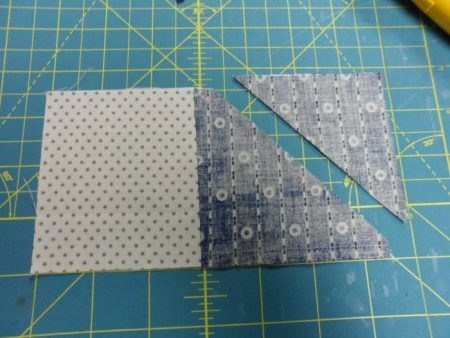 Start out with the rectangle that is 3 1/2 x 6 1/2″ and two squares that are 3 1/2″ square. Draw a diagonal line on the wrong side of the squares. 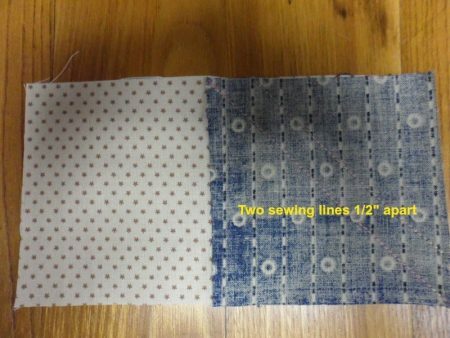 Once you have the square placed face down on the rectangle, sew along the drawn line and then sew another seam 1/2″ away from the first seam. If you want to mark that line too, feel free. Once you repeat this step on the other side and press the units open, you will have a flying geese unit and two half-square triangle squares. 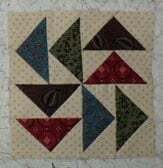 You can use the HST squares in the project you are making the geese for, or save them for another purpose! 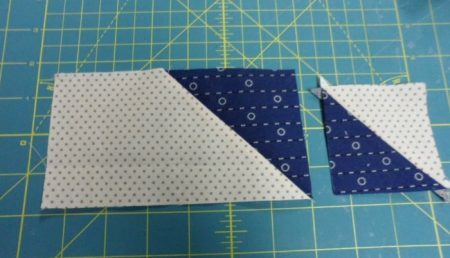 A geese unit that measures 3 1/2 x 6 1/2″ will yield two HST squares that can be trimmed to measure 2 1/2″ square. 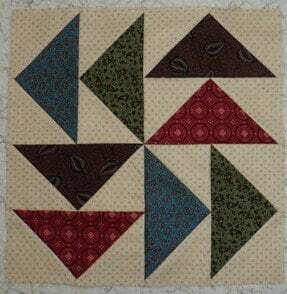 A geese unit that measures 2 1/ x 4 1/2″ yields two HST squares that can be trimmed to measure 1 1/2″ square. 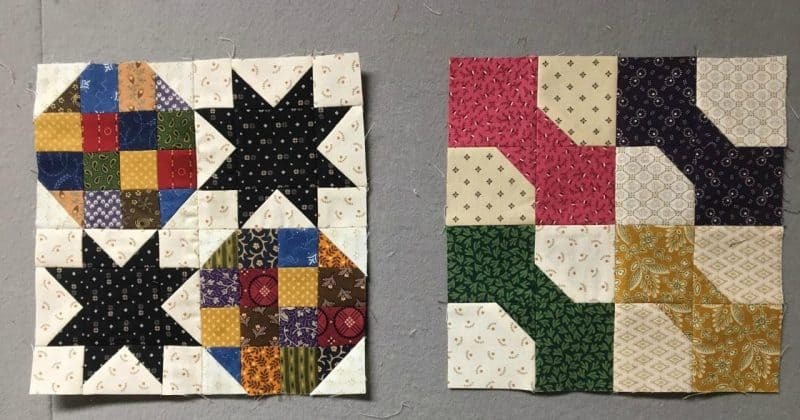 What can you do with these HST squares? 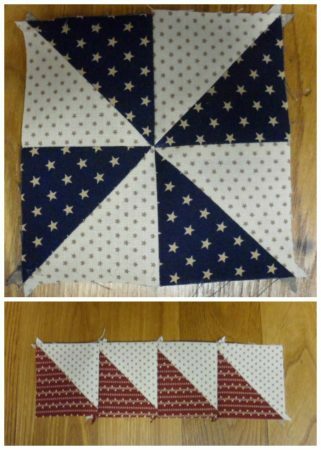 Make a pinwheel block with four of them or sew them together in a chain for an interesting pieced border. Or, just toss them in a container just for those HSTs. Then you can pull them out and whip up a small project with them. A candle mat, a small table runner or anything you can think of! So, there you go! 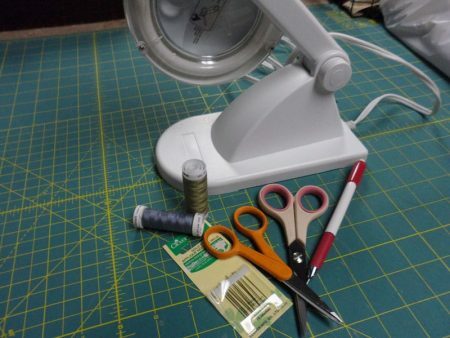 You won’t feel guilty about making those geese units and having to throw away expensive fabric. You will use every little bit and piece … eventually!